CARICOM Heads of Government in deep discussion. [from left] Prime Minister of Antigua & Barbuda, Gaston Brown, President of Guyana, David Granger, Prime Minister of St. Vincent and the Grenadines,Ralph Gonsalves. In the wake of the closure of Trinidad and Tobago’s state-owned oil refinery, Petrotrin, Guyana and several other Caribbean Community (CARICOM) member states are scrambling to buy fuel from extra-regional suppliers, Foreign Minister Carl Greenidge said Monday. “The Caribbean prime ministerial sub-committee looked at this matter and examined a couple of options that were available and they asked the relevant experts and ministers to explore the matter urgently and to advise,” he told a news conference. 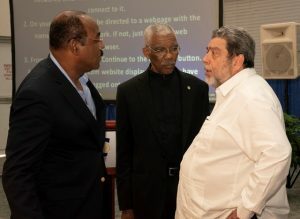 President David Granger, St Vincent and the Grenadines Prime Minister, Ralph Gonsalves, the Prime Minister of Antigua- Barbuda Gaston Brown, Barbados’ Prime Minister Mia Mottley and the Secretary General of Caricom, Irwin La Rocque participated in the sub-committee meeting. He also indicated that CARICOM was on the verge of abolishing the 40 percent Common External Tariff (CET) in order to avoid a spike in fuel prices at the pumps. When Guyana purchased fuel from Trinidad and Tobago, the CET was not applicable in keeping with the regional single market rules because the fuels were produced by a CARICOM member state. “There is a recognition that the barriers to importation from elsewhere is partly a fiscal barrier. In other words it arises from the CET and the ministers agreed that, in the circumstances, the Common External Tariff will have to be waived and the other sources will be explored,” he said. As far as fuel sources are concerned, the Guyana Foreign Minister said governments were considering purchasing from the United States or fuel storage facilities in Antigua, and Jamaica. Industry experts have also added that there are storage facilities in St. Lucia, Puerto Rico, and Statia. Remarking on the “special constraints” facing Guyana, he said his country’s “own storage capacity is relatively limited”. Greenidge said CARICOM leaders have been mandated to deal with the supply of fuels with “urgency”. “No time frame was set. Urgency was required so I don’t think it was necessary. They just know they have to come back quickly. There is not to be a delay arising from what would normally be required, namely COTED (Council for Trade and Economic Development) and CET. That would not be a constraint,” he said. Across in Grenada, Leader of Government Business in the Lower House of Parliament, last weekend informed the legislature that CARCOM member nations were would have to take immediate steps to ensure there is a continuous supply of fuels. With the closure of the bankrupt Petrotrin, he said SOL and other suppliers have asked for the removal of the CET. The Grenadian lawmaker reportedly cautioned that purchasing fuels from outside of CARICOM would result in increased fuel prices.